Built in 1912, The Chance Theater has had a long history as a performing arts venue. It was opened as a vaudeville house called the Dutchess Theatre in 1926. It became the Carol Players Playhouse, then the Playhouse Theatre in 1928. Showing vaudeville and films at the time, the theatre introduced silent film in the 1920′s. The venue changed ownership many times throughout the 1920′s and 1930′s. From 1945 to 1970 the building was closed and was used as a storage facility. 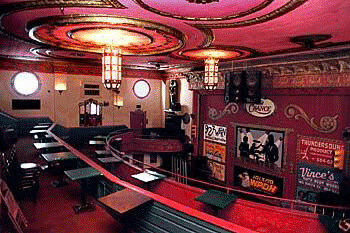 In 1970 Larry Plover opened the venue as “Sal’s last Chance Saloon”. Plover turned the old vaudeville theatre into a music venue; welcoming legendary acts such as The Police, The Ramones, Muddy Waters, Pete Seeger and Charles Mingus. Closed again in 1977, Peter Francese re-opened the venue in 1980 under the name “The Chance”. In 1994 current owner, Frank Pallett acquired the legendary music venue. Pallett has brought acts such as Bob Dylan, David Bowie, Ted Nugent and countless other contemporary and classic rock bands to Poughkeepsie, NY.